Starting November 21st, Stanbridge College REACH will host its annual Children’s Toy Drive for the Marine Toys for Tots Foundation. 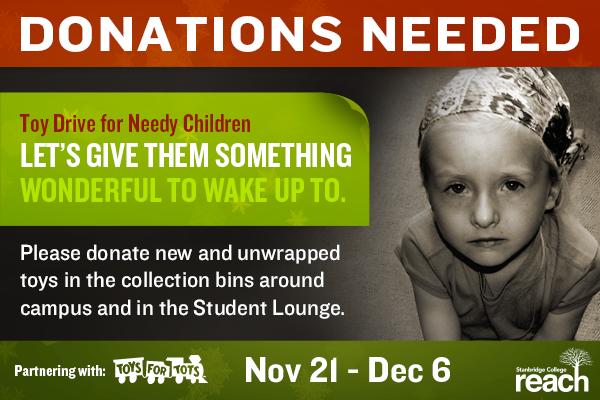 We are asking for donations of new toys to give to children in Orange County in need of extra Christmas spirit. Many of these children are in need; they are suffering from illness, their family is living in a motel, and some can’t afford to spend money on gifts this Christmas. Your donation will go to helping their face light up on Christmas morning. The donations do not need to be expensive or be the latest or must-have item of the year. Any contribution will show them that Santa really does exist. If you are able to, please bring a new and unwrapped toy to the Stanbridge College Student Lounge or Administration room 107. The drive will end on Friday, December 6, 2013. We encourage you to invite your family and friends to donate as well! Feel the true meaning of Christmas and giving as we support this wonderful cause.